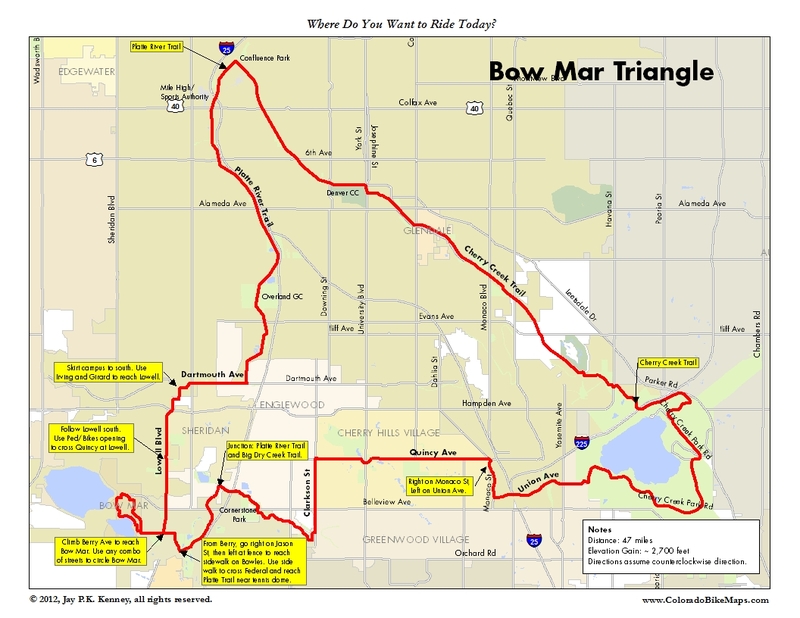 Like the Florida West Line Loop, this route heads west on Florida and returns on the Lakewood Dry Gulch Trail. Instead of turning back at Alameda Ave, continue climbing on the southeast side of Alameda from Green Mountain and descend to the intersection with Jewell Ave and Bear Creek Blvd. From there, transition from the trail to the shoulder of Alameda Ave and head west towards the C-470 Trail, Red Rocks, and Morrison. Before you cross C-470 check for traffic and turn left immediately after Rooney Rd onto a spur of the trail. 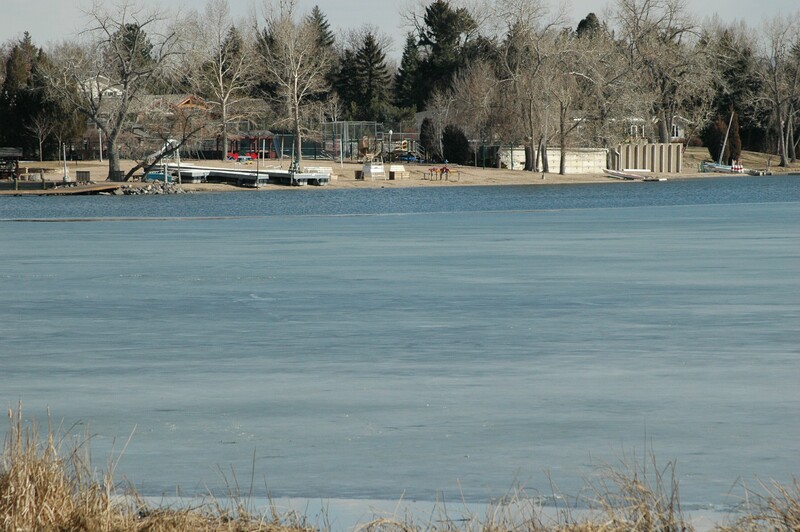 This takes you down to the C-470 trail which connects Chatfield Reservoir and the Platte River Trail to Golden and the 6th Ave Trail. Ride north on the trail and check your tolerance for dirt, local conditions and either exit the trail on a short, steep dirt trail or circumnavigate the Jefferson County Fairgrounds to reach Indiana Ave and 6th Ave. The dirt trail takes you up to Bayaud and Ellsworth Ave and then down a bomber descent to the same intersection. This is a busy intersection, especially at rush hour, so use caution as you make your way through it. A sidewalk on the west side of Indiana under 6th Ave provides a safe haven in both directions if you don’t feel like dueling with traffic. The rest of the route is just fun and interesting with only the on/off ramp at 13th Ave and Kipling St providing any real excitement. Use a little caution as you enter and exit the ramp: there’s frequently sand at the bottom of the ramp and the design requires a 90 degree turn onto a narrow sidewalk, onto or from 14th Ave.
Metro Denver has a goodly number of fine roads that run east and west (think Dartmouth Ave, Montview Blvd, 26th Ave, and 46th Ave just to name a few) but not nearly enough that run north and south. I’m not sure why this is so and I speculate about it endlessly as I flog my way north and south, interrupted by stoplights, stop signs, hospitals, and golf courses. I’m being slightly hyperbolic. Tennyson St, Zuni St, and Lowell Blvd are good in stretches. Holly St is OK. Sable Blvd in Aurora works OK if traffic intensity is light. Further west Rooney Rd and Johnson Rd connect to create a really good stretch of climbing heaven. 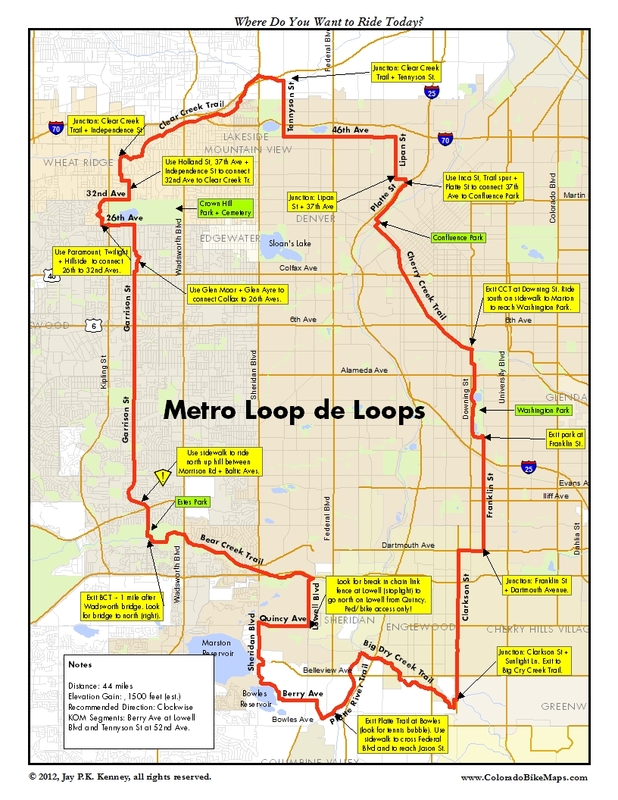 That dearth of good north south routes was the genesis of the Metro Loop de Loops ride. Garrison St on the west runs mostly uninterrupted from US 285 (Hampden Ave) to 26th Ave, much of it with a dedicated bike lane. It totals about 7 miles if you include the stretch of Estes St between Morrison Rd and US 285. The east side of this loop is a little more cobbled together: the “standard” route through Washington Park to Dartmouth Ave and then to Clarkson St. The beauties of this loop are many. 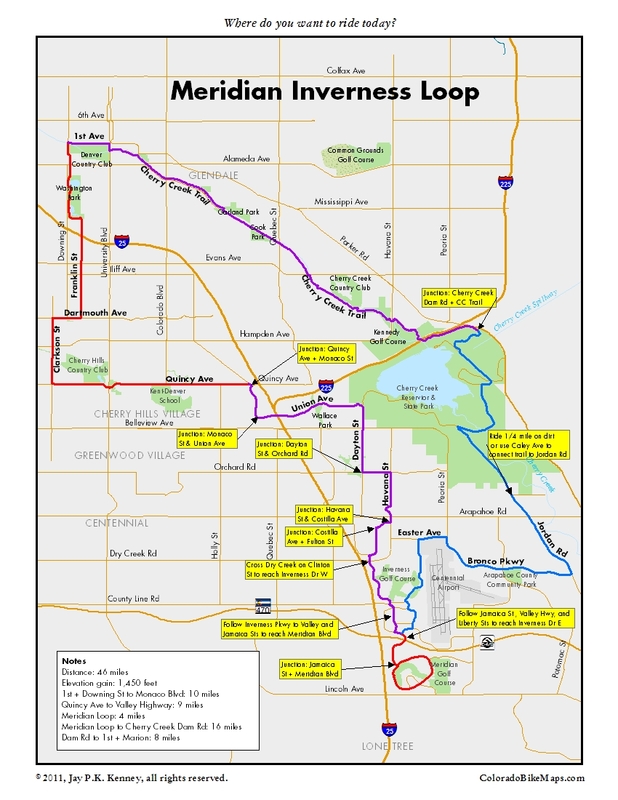 You’ll use portions of five of the metro area trail systems (Cherry Creek, Clear Creek, South Platte River, Big Dry Creek, and Bear Creek). You’ll pass through or near multiple parks and golf courses. You’ll ride by at least five big lakes and reservoirs. Add in two KOM segments at Berry Ave and Tennyson St and you’ve got all the makings of a classic metro loop. The route finding is pretty straightforward with maybe three tricky spots at Bowles Ave, in Wheatridge, and then in sneaking across 38th Ave to return to Confluence Park. These are all places you are likely to return to at some point in your cycling life so you may as well figure them out now. I’m including a couple of detailed maps to help you if this is your first time. If you’ve ridden some of CBM’s other routes, you’ll recognize this as a conglomerate of several other routes. The description below is for a clockwise ride, which I like for the short climbing segments on Berry Ave and Tennyson St. Switch them around in your head if you want to go the other way. Start in Confluence Park. Head upstream along the Cherry Creek Trail to exit at Downing and make your way through Washington Park. Exit the park at Franklin St and work your way south and slightly west to Clarkson St. Ride Clarkson all the way south to Sunset Lane (3 miles) and watch for the Big Dry Creek signs. Jog over to Washington St and Powers Ave and you’ll soon be flying down the Big Dry Creek Trail to join the S Platte Trail, about 2.5 miles. Go south about 1.5 miles and exit at a roundabout immediately before Bowles Ave. Look for the big white tennis bubble as your landmark. Skirt the bubble to the south to gain the sidewalk of Bowles. Cross Federal Blvd (carefully!) on the sidewalk and ride west (still on the Bowles Ave sidewalk) to a narrow fence opening onto Julian St. Home free. Ride north on Julian St to Berry Ave. Go west. The first KOM segment begins at Lowell Blvd. and climbs 5-6 blocks steeply. 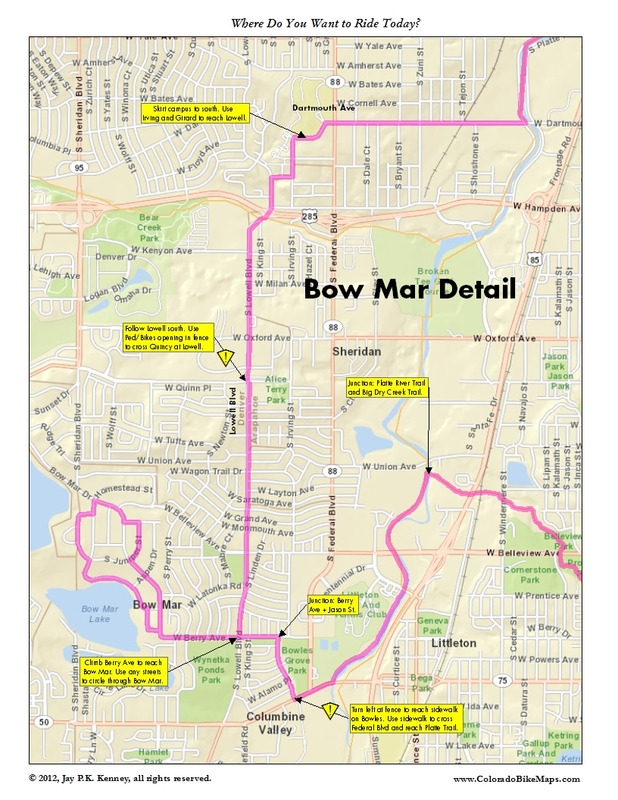 Ride through the Bow Mar area skirting Bowles and Marston Reservoirs on roads of your choice (there are several options, all good) or just stay on Bow Mar Drive to connect to Sheridan Blvd. Take note of but ignore the signs at the entrance to Bow Mar that say there’s no exit. They are liars. Ride out of Bow Mar on Sheridan to Quincy and turn east. Both Sheridan and Quincy are fine for riding a bike. At the Lowell Blvd traffic light go south (left) through a narrow opening in the chain link fence. If it is your first time, use caution: cars are not really expecting you to make a left turn here. Ride south on Lowell Blvd past Fort Logan, CMHI, and Mullen School. Just past Mullen, look for the Bear Creek Trail at grade on your left. Get on it and go. This used to be a nasty section of trail but has been considerably improved in the last year (2011) and now makes for some OK riding. (If you want more climbing, stay on Lowell north to Dartmouth Ave and ride it west until it joins the Bear Creek Trail at Webster St.) Ride the trail west to Estes Park, about 3.8 miles. Exit the trail to the north, across Bear Creek on a bridge. There’s no signage, so if it is your first time, watch your odometer: about one mile from Webster St where the trail crosses Bear Creek. Estes Park makes a fine snack/refuel/pit stop. There are restrooms located in the middle of the parking lot. Ride north on Estes St and Garrison St. As you cross Morrison Rd look for the sidewalk+path on your right. Take it and ride up the hill to Baltic Ave. I don’t usually strongly recommend a sidewalk, but I make an exception here. The short stretch between Morrison Rd and Baltic is scary-narrow with little room for recovery from another’s inattention. Southbound riders have a good bike lane. Ride north until you reach 26th Ave. The bike lane disappears in a couple of places but heads up riding is all it takes to stay safe along this fine stretch of urban riding. Between Colfax Ave and 20th Ave follow the path of least resistance through a series of Scottish themed streets. At 26th Ave ride west. Cross Kipling St. Go north on Paramount, Twilight and Hillside to reach 32nd Ave. Alternatively, you can easily ride one of the many trails through Crown Hill Park to reach 32nd Ave. At 32nd Ave access Holland St, 37th Ave, and Independence St to make your way north to the Clear Creek Trail. Ride northeast on Clear Creek Trail. This is probably the nicest stretch of Trail, good shade cover from the many large cottonwood trees, proximity to the creek itself, and little of the urban industrial blight that plagues the stretch between Tennyson St and and the confluence with the S. Platte River. It is about 4.3 miles to the at grade intersection with Tennyson St. with all of it on the trail except for a two block stretch between 51st and 52nd Aves at Gray St. Follow the signs northerly (or southerly if you’re coming the other direction) and you’ll be fine. 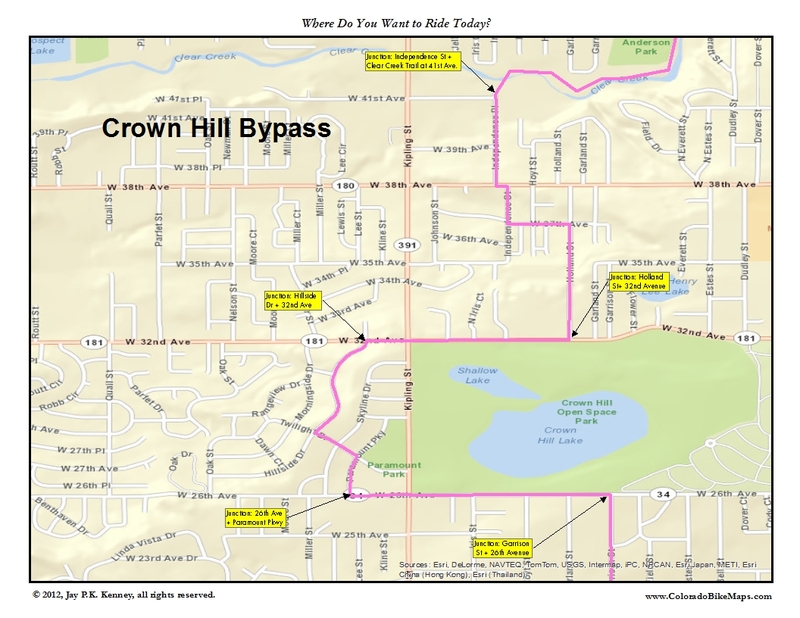 Ride south on Tennyson St, jogging west and south at 52nd Ave to gain the high ground next to Willis Case Golf Course. This is the other short KOM segment. Ride south to 46th Ave. Turn east and ride to Lipan St. Go south to 37th Ave, east to Inca St and south to a short spur of trail that disappears under the bulk of the I-25 overpass looming in front of you. Follow the spur to Rockmont Dr and Platte St (the one turns into the other at Cuernavaca Park). Platte Street returns you to 15th St and Confluence Park. If you’re smart, though, you’ll stop at the Denver Beer Company for a pint to celebrate. 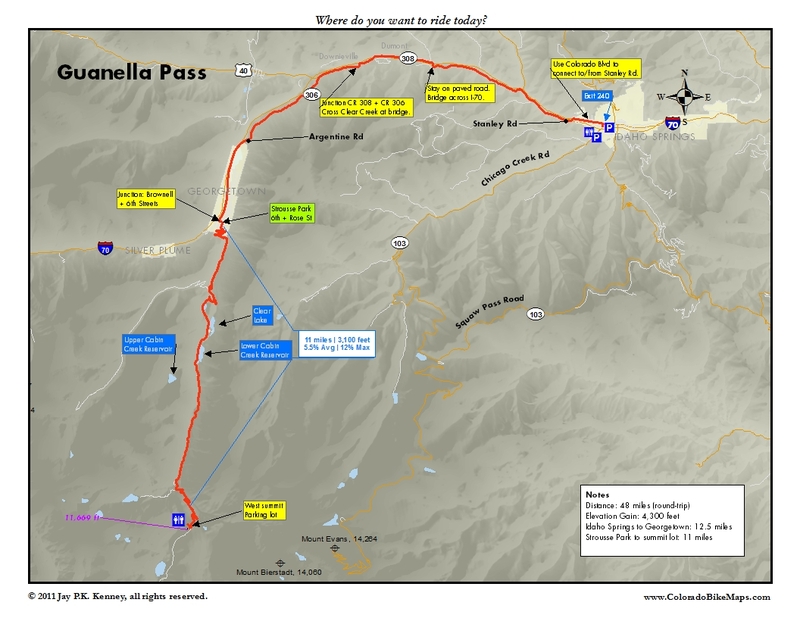 Guanella Pass runs from I-70 at Georgetown to US 285 just west of Bailey. For the full version of the pass, check out this post. The pass was paved in 2012 (but not quite all the way to US 285), thus adding yet another classic climb to a state that already has an embarrassment of riches in long, steep climbs. Start in Georgetown or better yet start in Idaho Springs. 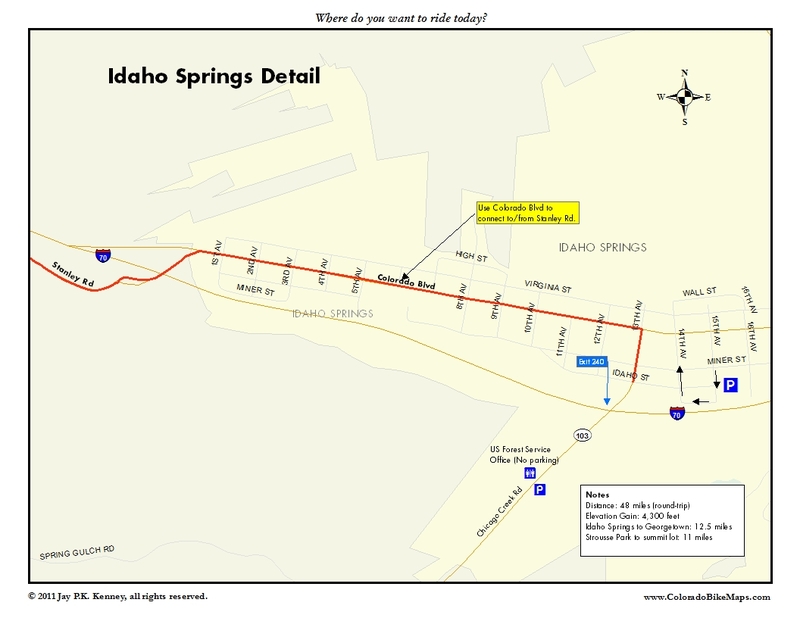 If you start in Idaho Springs , it is 24 miles one way with 4,300 feet of climbing. All but 1,000 feet happen in the 10.5 miles from Georgetown. There are steep sections at the beginning and end that flirt with double digits and a few small breaks as you work your way past a series of artificial reservoirs used to generate electricity through a pump-back process. By the time you reach the top (11,670 feet), you’re above treeline and the views of Mt Evans and Bierstadt are extraordinary. 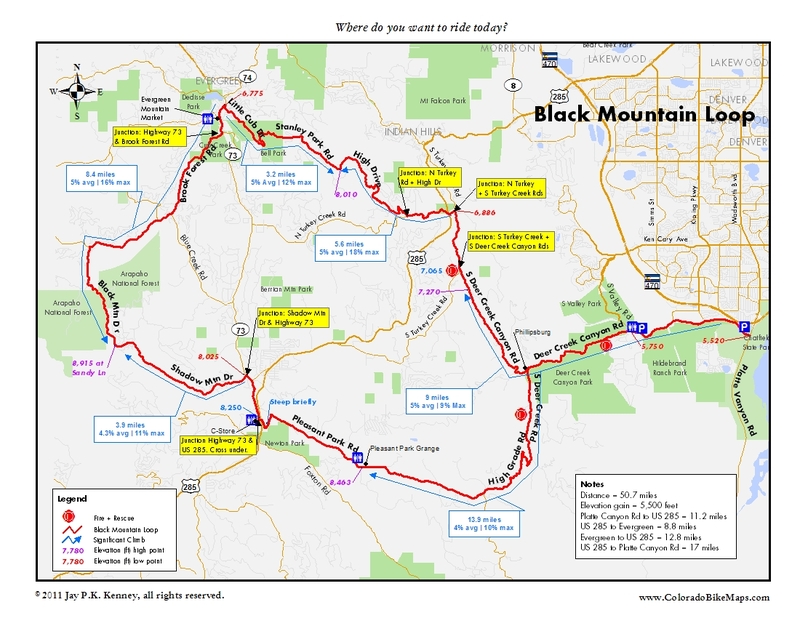 The climb will certainly become one of the classic Colorado climbs, as hard or harder than Squaw Pass from Idaho Springs, Vail Pass (from the west), Lefthand Canyon, and Golden Gate Canyon. As I understand the Rocky Mountain Cycling Club’s formula for difficulty, Guanella Pass rates as the fifth or sixth hardest climb in the state, right up there with Trail Ridge from the east and Molas Pass from the south. There’s good parking in Idaho Springs at the lot behind Beau Jo’s and also next to the EMS station on Chicago Creek Rd, with free Forest Service bathrooms at the NFS Ranger Station. Don’t actually park in the Forest Service lot–it is for short term information and bathrooms only. The ride up to Georgetown along the frontage road you probably know from shortcuts in the winter when I-70 is backed up. When there’s no traffic, the ride is a sweet one, next to Clear Creek and with little traffic. Leave Idaho Springs on Colorado Blvd. Cross immediately to the south side as you reach the western outskirts of Idaho Springs. Ride upstream. Near Dumont cross back to the north side. This will be obvious because you just need to follow the paved road. Ride through Downieville (there’s a Starbucks there and a convenience store) and cross under I-70. Ride 1/2 mile to a fork. Go left to cross Clear Creek one more time and follow what’s known as Alvaredo Rd and CR 306 all the way into Georgetown. The road is in good shape. Ride into Georgetown on what is now Argentine St. At the Y with Loop Rd, bear left on Brownell St. Turn left on 6th St, right on Rose St and you’ll be climbing for real in a few short blocks. The climb begins steeply with switchbacks, levels out for a few short moments near the hydropower reservoirs, and gets steep again at the top. You can read a detailed description in Russell Harding’s Blog, The Road to Cat 1, if you like to know in advance how much you are going to suffer. I know I adapt badly to altitude so reading a detailed description does not help me much. Anytime above 9,000 feet hurts. But here’s the profile if you’re a visual learner. At the top, there’s a large lot to the west with a Forest Service outhouse if you need it. The views are great and the descent is fast and smooth, a treat if you’ve ever suffered coming down from Mount Evans, which you can see from the top to the east. This route is a crowd-pleaser. Remember the old jingle about Sara Lee? “Everybody doesn’t like something, but nobody doesn’t like Sara Lee.” That’s a phrase that Don Draper could come up with. This route is Mad Men good. It is a longer variant of several shorter rides that are in Great Road Rides Denver combined to make a longer mash-up. 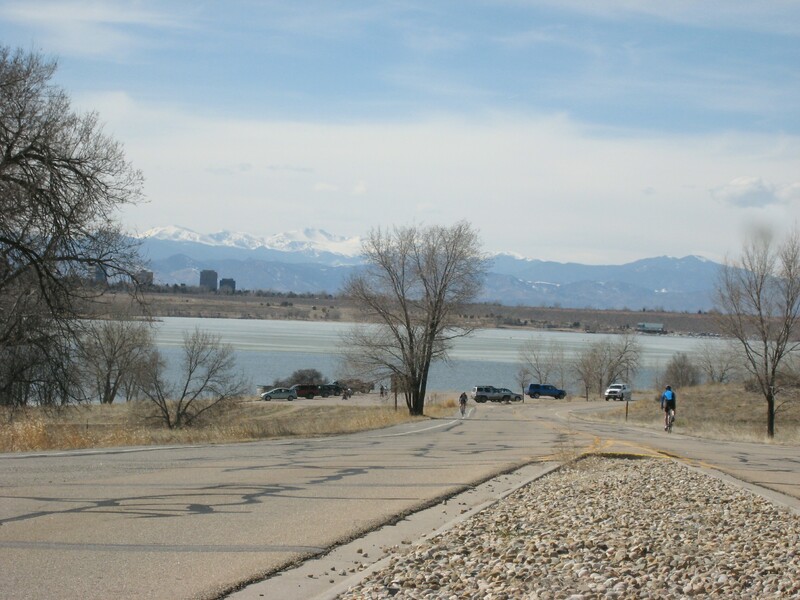 There are stretches on good cycling roads like Dartmouth and Quincy, stretches on three different trail systems, and a long loop around Cherry Creek Reservoir. Were that not enough, there are also two sneaky moves through fences–surprise passages that appear like some deus ex machina to whisk you through a fence just when you think you’ve hit a dead end. And did I mention the three killer KOM sections? And, of course, there are multiple ways to shorten it if you hit by bad weather or just feel guilty that you are outside having so much fun. Start it anywhere on the loop. For descriptive purposes I’ll assume you are beginning somewhere along the Cherry Creek Trail. Ride to Confluence Park. Follow the Platte Trail upriver (south) until you come to Dartmouth Ave. Some people prefer to get to the streets immediately and if you are one of those, you can jump onto Jason st around Habitat Park and ride it and Platte River St south to Dartmouth. It is probably faster to stay on the trail, but the view never really changes if you do. Head west on Dartmouth and climb up to the old Loretto Heights College campus, detouring (if you’re interested) at the Bryant St hill for the first KOM section. Circle the campus to the south using Irving St, Girard Ave, and Knox Ct to reach your southbound goal, Lowell Blvd. The school on the hill has had multiple names and identities in the last few years, too many to keep track of really, so I just keep calling it the old Loretto Heights College. By any name, the main building is worth a second look. Ride east on Berry Ave to Jason Street. Go south a few blocks to where the street seems to dead end in a mandatory right turn. Sneak left here through an opening in the fence to gain a sidewalk next to Bowles Ave. Cross Federal Blvd at the light and continue east to the Platte River Trail. The access is a little obscure but you’ll get there if you aim for the white bubble building and bear right. Ride north on the trail to Big Dry Creek and cross the South Plate on the bridge to go east and south on the BDC Trail. It will dump you at Powers Ave and Washington St. Go north on Washington to Sunset and Clarkson St. Ride south on Clarkson to Quincy Ave. If you are running out of time, keep riding north no Clarkson to return to Denver, using Dartmouth and Franklin St, for example to return through Washington Park. 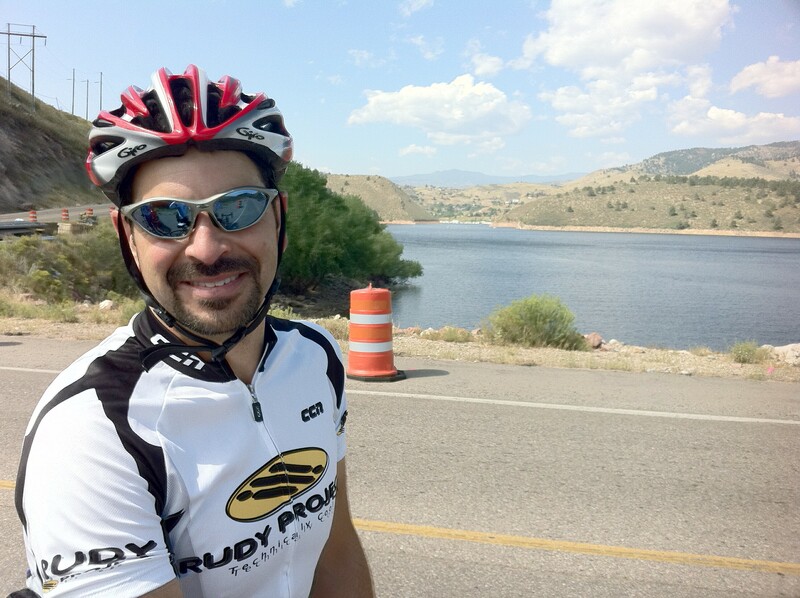 Ride Quincy Ave east to Monaco St, passing Cherry Hills Country Club and Kent Denver School along the way. The third KOM usually begins at Colorado Blvd and runs to Happy Canyon Rd. 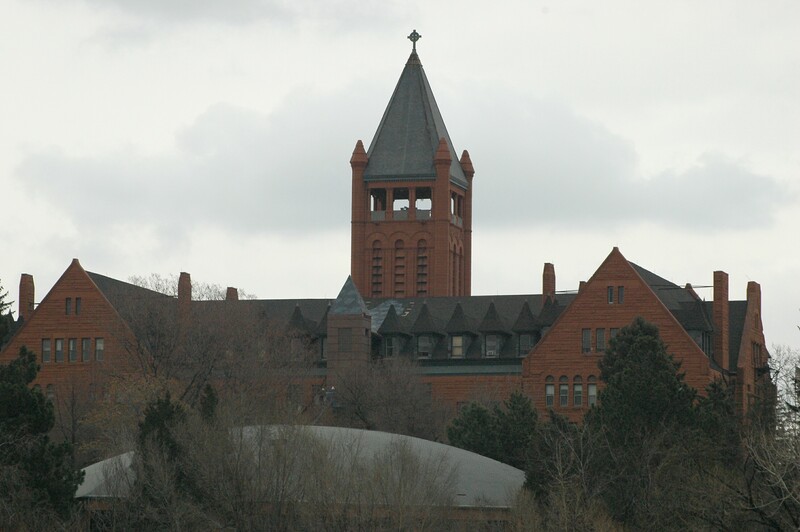 Go right to Monaco and ride to Union Blvd, then east through the Denver Tech Center to Cherry Creek Reservoir. Circumnavigate the reservoir or bypass it depending on your mood. Return to Denver on the Cherry Creek Trail. 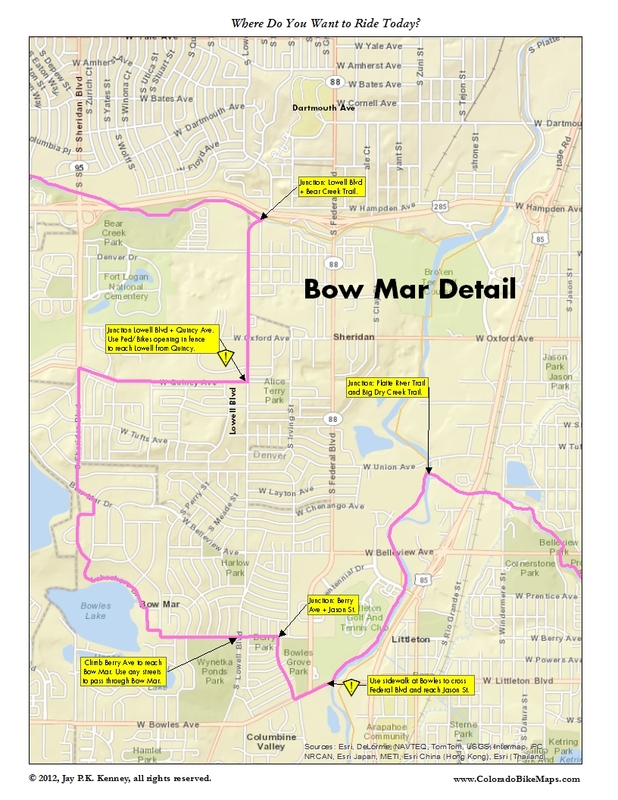 Here’s a map of the Bow Mar section, the most likely spot where things can get confused. PDF link. As much as I like riding in the Front Range foothills and Colorado mountains, there are days when I’m too beat or don’t have enough time to drive anywhere, yet still want a long, quality ride. It’s not impossible, you just have to work a bit. 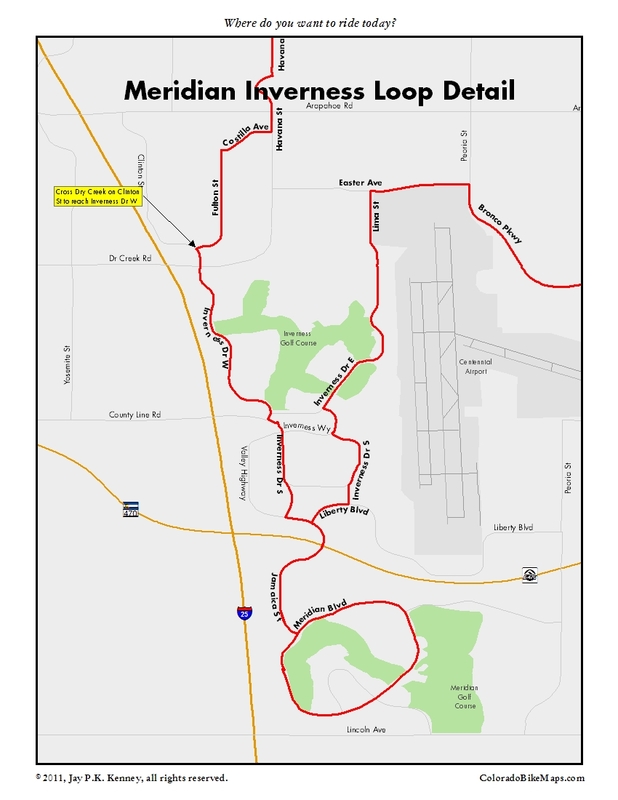 The Meridian Inverness Loop perfectly fits the bill. 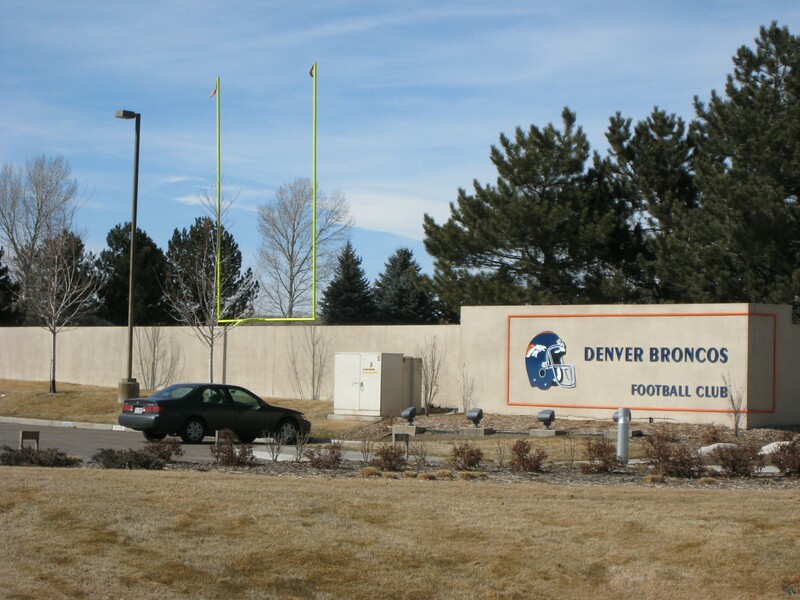 A similar but shorter loop, “Dove Valley,” was featured in Great Road Rides Denver. At 46 miles, the MI Loop is just as good for a leisurely ride as it is for a weekend hammerfest, with a one lap crit thrown in for good measure at Meridian. If you don’t know your local history, both Inverness and Meridian are business parks built around golf courses, which makes them perfect places for cyclists after work and on the weekends. And if you don’t want to be bothered with the ride to get out there, there are Light Rail stops at both Dry Creek and County Line Roads that provide easy access to the good stuff. This is a good weekend ride, when business and commuting traffic is at its lowest. But during the week, the business park roads get busy and you’ll want to be riding with a heads up attitude. Begin in central Denver. Head south through Washington Park and jog west to Clarkson and south to Quincy Ave. Go east almost 3.5 miles along Quincy Ave through Cherry Hills Village. This is a good stretch of riding, with a long uphill pull from University Blvd to Happy Canyon Rd. If the traffic is heavy, there’s an OK (if sometimes thorny) path to the south you can use. At Happy Canyon head southeast then south to Monaco St, which in turns connects you to Union Blvd, your ticket through the Denver Tech Center. 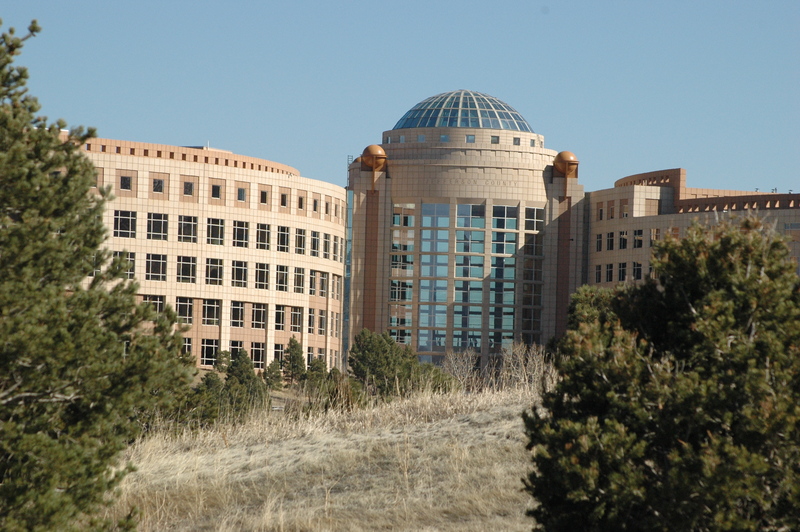 Climb out of the Tech Center, pass Cherry Creek High School and head south at the Dam Rd light to Dayton Street. Stay on Dayton heading south to Orchard Rd. Go left here to reach Havana St, then south to cross Arapahoe Road. One of my Great Road Rides correspondents hates the intersection of Havana and Arapahoe Rd for all the heavy traffic, but I won’t have a better solution until there’s a bike lane all the way south on Dayton. So for now, at least, cross Arapahoe carefully, then get off it immediately after the light with a left (west) on Costilla Ave. The fun begins. Work your way south and west along Costilla and Fulton Street, then use Clinton St to cross Dry Creek Rd. Work your way south on Inverness Dr W and Inverness Parkway to reach Valley Highway, which is the link between Inverness and Meridian. Use this detailed map if you find the constant road name changes confusing. And don’t sweat the name: Valley Highway is not a highway at all–presumably it is just to honor the historic name for for the first portion of I-25 through central Denver to be completed (1950). Pass under E-470. Follow Valley Hwy in a long S-turn to connect, via Jamaica St, with Meridian Blvd. Make a lap or two. There are only two stop lights to slow you down. When you’re ready, exit Meridian and return the way you came along Jamaica and Valley. Bear right after E-470 on Liberty Blvd to connect to Inverness Dr S, which will take you along the southeast side of the Inverness development and then connect to Inverness Dr E. You’ll know you are on the right path if you can look to the right and see the west side of Centenntial Airport–the jets taking off and landing should be a good landmark. Skirt the airport on the north and east using Easter Ave and Peoria St. You’ll know to turn when you see a giant white bubble to the north. Cruise south on Peoria and the east along Bronco Pkwy, where new road construction has added a dedicated and sometimes welcome bike lane. A few good rollers bring you to Jordan Rd. Go left for now. Although the Cherry Creek Trail is just east of the Jordan Rd and Bronco Pkwy junction, there’s still a link missing at Arapahoe Rd. After crossing Arapahoe Rd, you can either ride a short stretch of dirt road to enter Cherry Creek State Park, or follow the signs east on Caley Ave to connect to Cherry Creek Trail. Follow Jordan Rd or the trail to the main Park Rd. Use it to circle the east side of the Park. Exit the park at the east end of the Cherry Creek Dam Rd, using caution at the intersection. Follow the Cherry Creek Trail back to Denver. you’ll fly home–it’s slightly downhill the whole way. 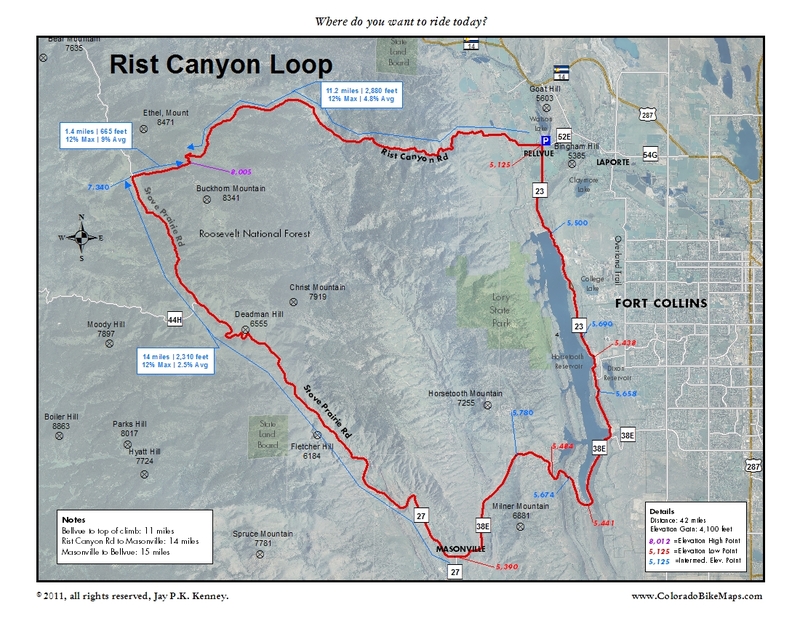 Rist Canyon Loop easily makes my top 10 list of favorite loop rides along the Front Range. 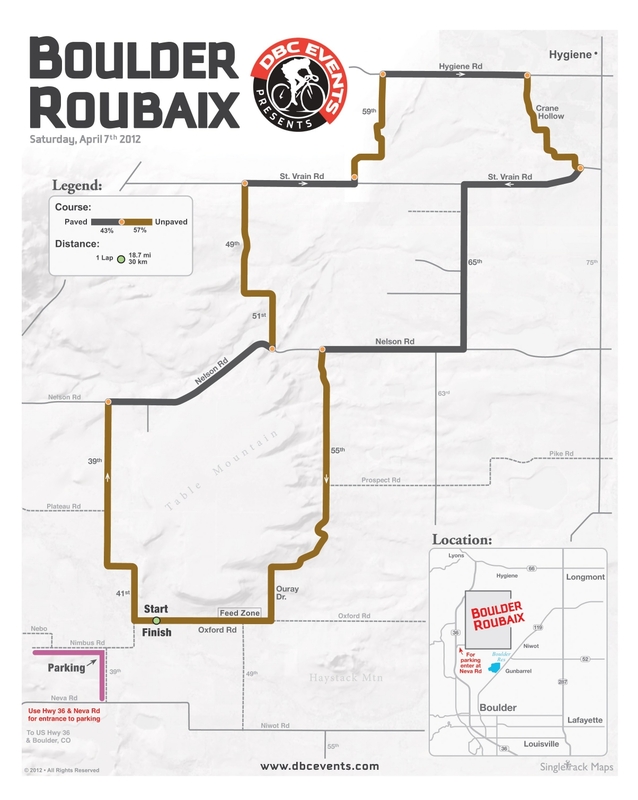 It is a perfect distance (42 miles), has a slew of both steep and interesting climbing, is surprisingly remote for being so close to Fort Collins, and the bulk of the route wanders through the Roosevelt National Forest or alongside (and looking down on) Horsetooth Reservoir. Were it closer to Denver and Boulder, it’d be overrun with cyclists, sort of like Deer Creek Canyon and Lookout Mountain are. As it is, during the week you’ll be pretty much on your own, with the FC crowd showing up on the weekends. The stretch along Horsetooth Reservoir makes a convenient loop for FC regulars and there’s an annualFort Collins Cycling Festival that usually includes some version of Rist Canyon in its line-up, as a long road race or as a shorter, hill climb. 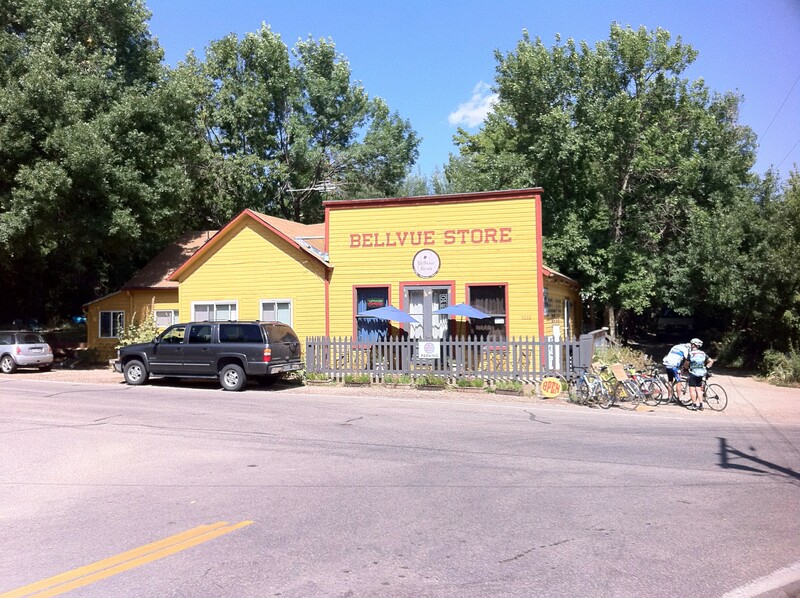 There are multiple places you could start this loop along Horsetooth Reservoir or in Fort Collins (from where a convenient bike path winds it way along the Poudre River), but I’m a confirmed espresso junky so the hamlet of Bellvue is the only way to go. As you come in from I-25, Fort Collins, and Laporte, look for the Trout Rearing Hatchery sign and dirt parking lot just before Bellvue at the junction of Rist Canyon Rd and Route 23. Park there, suit up, and pedal 50 yards to the Bellvue Bean for a quick espresso jolt or a muffin and you’ll be set to go. Head west through rolling farm land and just keep going. Soon the farm land disappears and you’ll be climbing through a tight canyon with evergreens pressing in on both sides. Periodically the trees peel back to reveal an old homestead, a dilapidated hay rake, or a small ranch nestled into the hillside. Views of the distant Mummy Range flit in and out of your vision. The climbing is pretty steady, with short breaks where the road levels off for a respite. After five miles or so the canyon walls fall back, and give you a better picture of where you are. The higher you go, the steeper it gets. Pause for a snack and a drink, and enjoy the view at the top. Drop steeply to Stove Prairie Road. Go left, southeast to Masonville. The road falls out from underneath you for most of this stretch–sometimes steeply, sometimes gradually. The closer you get to Masonville (really not much more than a junction in the road) the less remote the ride feels. Press on. There’s still great riding ahead. Traffic will increase slightly here, bearing tourists and their toys to the reservoir. If you need water or a pit stop, look for the Larimer County Open Space Trailhead on your left, just after topping out of the climb from Masonville. There’s also a liquor store just past Shoreline Dr if you need something stronger. And even though you left Rist Canyon some 20 miles back, there’s still some climbing to do. The road tilts up in short, sharp, shocks three more times before you get back to Bellvue. None of these is very long, but they are steep, mostly in the 8% to 12% range and can be demoralizing if you’ve started to bonk. 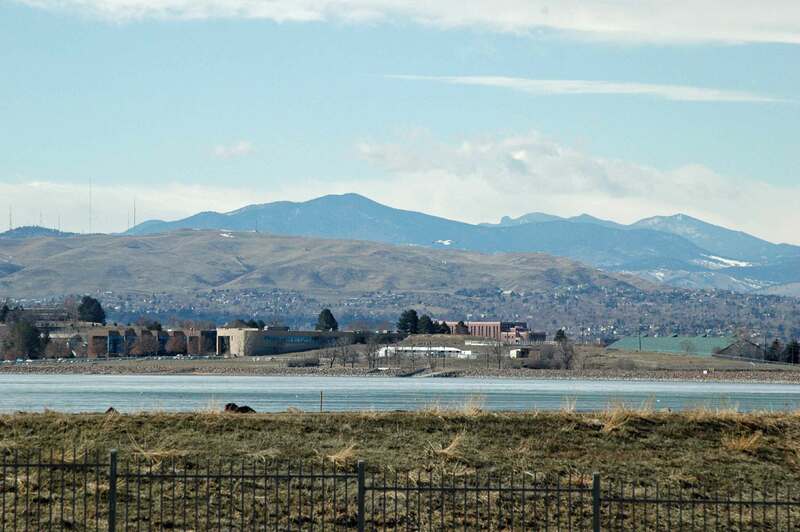 The views east across Fort Collins and west across the reservoir more than make up for the minor pain you’ll feel. At the north end of the reservoir the road plunges down once more into the alfalfa fields south of Bellvue. Look for the historic grange as you pull back into town. The only wrong with this ride is that it is not closer to my house. I don’t know if I have enough superlatives in my vocabulary for this loop. The climbing is exceptionally varied. 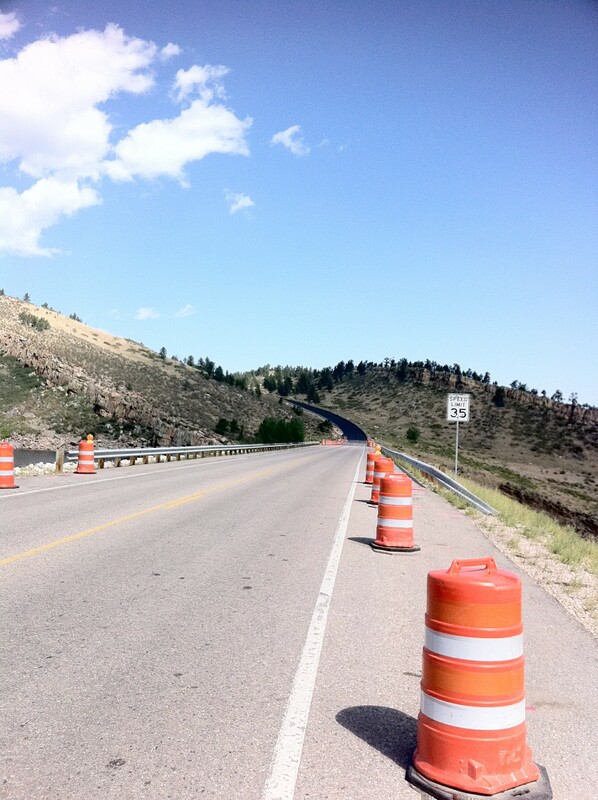 There are long, sustained climbs from Chatfield Reservoir, up Deer Creek Canyon or High Grade Road. There are ridiculously steep stretches (most mercifully short) along High Drive and Little Cub Drive that will make you check to see if you’re in your largest cog. And there is the climb for which the route is named, an 8.5 mile heart-breaker that gets steeper the higher you go. That’s only the climbing. You’ll pass through or nearby more than eight local and regional parks and one small section of the Arapahoe National Forest. Even outside these protected areas, you will mostly be traveling through forested areas. The views from High Drive, Black Mountain Drive, and High Grade Road are spectacular. The traffic is generally light. And there are places to refuel along the way, everything from the prosaic convenience store at US 285 and Highway 73 to the Evergreen Mountain Market and the Pleasant Park Grange. If you don’t pay too much attention to the names of the roads, the route-finding is straightforward. Confusingly, the same stretch of road bears three different names: Little Cub Drive, Stanley Park Road, and High Drive, for example. Or Brook Forest Rd, Black Mountain Drive, and Shadow Mountain Drive. Just stay on and follow the main roads, however, and you’ll do fine. Or ask one of the many cyclists you’ll encounter for help. The logical place to start this ride from is the intersection of Platte Canyon Rd and Deer Creek Canyon Rd. There’s lots of room on both sides of the road, but no amenities. Or slightly further west, there’s a small lot at South Valley Park. 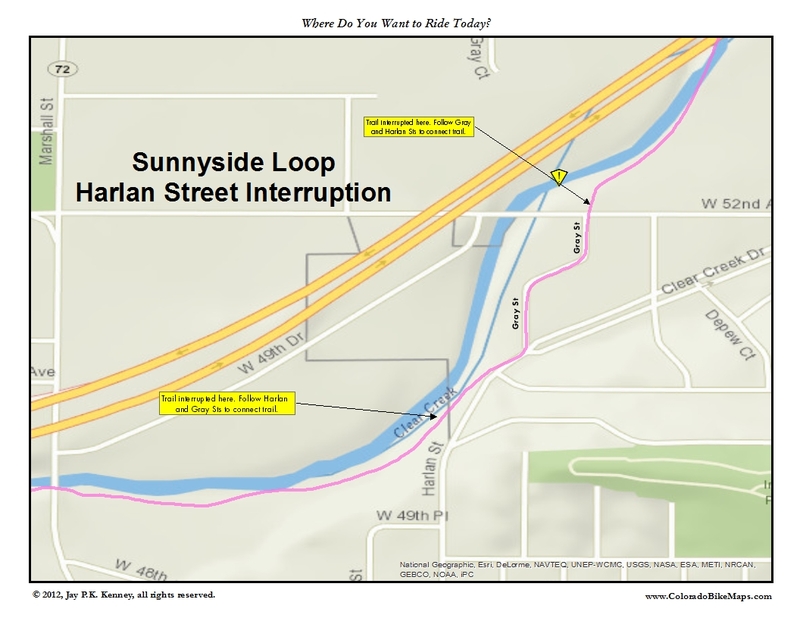 Or you could shorten the loop slightly by driving up US 285 aways and starting near the North Turkey Creek/South Turkey Creek junction. To really enjoy the Black Mountain climb, ride counterclockwise. On the way up from Chatfield, you’ll pass the hamlet of Phillipsburg. Named for a late 19th century developer who hoped to profit from gold and mineral prospectors in the region, the town prospered briefly then completely faded away by 1930. 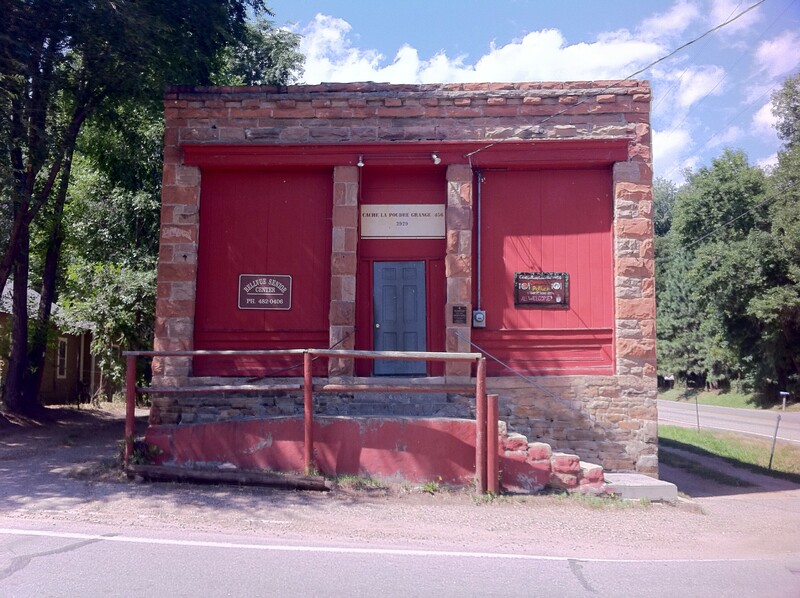 Colorado’s most famous cannibal, Alferd Packer, lived and died here after his release from prison in 1905. A nine mile climb and a short descent brings you to South Turkey Creek Road. A fire station there makes a convenient regrouping place. Continue north to North Turkey Creek Rd. Reach it by passing under US 285 and then climb a short distance to High Drive. The steep climbing starts here and continues for four miles. Descend to Evergreen. The intersection with Highway 74 is sketchy. If you are going slow enough on the descent, you can avoid it with a sharp left near the bottom onto Camel Heights Road. Look for the Evergreen Mountain Market here to refuel and use a bathroom. Head up Highway 73 briefly, then go right on Brook Forest Road. If you can ignore the pain, this is a beautiful stretch of road that gets better the farther you ride. You’ll pass the historic Brook Forest Inn five miles after turning off Highway 73. The climb finally tops out at 8,900 feet and there’s a fine descent back down to Highway 73. Go south on 73 and then east on Pleasant Park Road to complete your loop, climbing steeply one last time from 285. Stop at the Pleasant Park Grange for a Gatorade and a snack. There’s also a porta-potty. Proceeds benefit the historic grange. When you’re ready for the 14 mile descent, head on down, back to Phillipsburg. From time to time, a Jefferson County Deputy parks at the intersection there, so look twice before you blow through the Stop Sign. 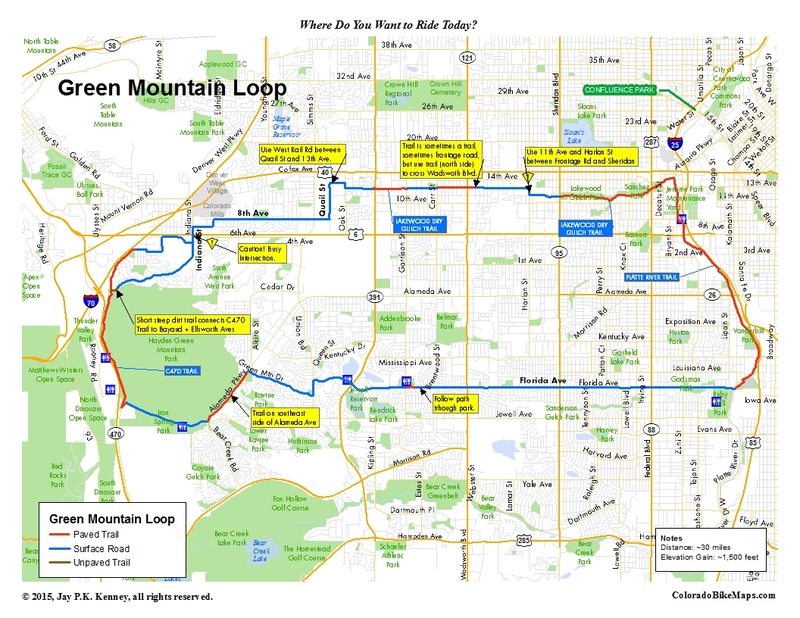 This is another of the truly great loop rides Denverites have in their backyard. 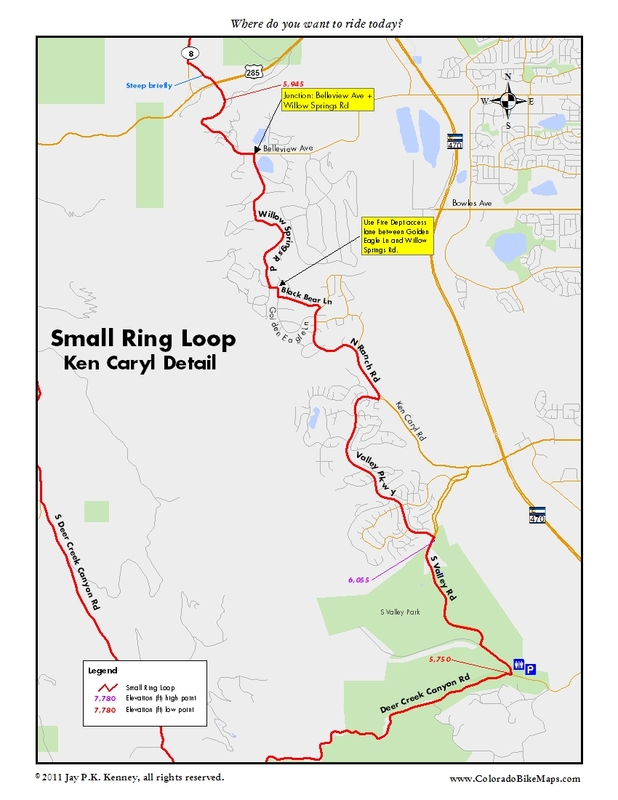 In terms of overall aesthetic quality, the Small Ring Loop ranks way high on my fun-meter, especially so since it traverse so much terrain–everything from Lookout Mountain to Red Rocks Park and nearly everything in between, including Kittridge, Bergen Park, Morrison, a trio of gulches, and two country clubs. A two mile stretch on the I-70 shoulder and a 1/4 mile stretch on and across US 285 are probably the only serious negatives. It rides well in both directions, though I confess to preferring to ride it counterclockwise. I’d rather come down Deer Creek Canyon than ride up, I prefer to ride Highway 8 into Morrison (it is downhill) than to ride out, and I love the steep climb up into Red Rocks from Highway 74 from Entrance #3. But that’s just personal preference. Ride it and find out for yourself. The route-finding through the Ken Caryl development can be tortuous, but it is hard to go too far awry–if you keep going generally north or south, you’ll come out OK. I’ve included a detailed map of the area below that you can tuck in your jersey to help you along. in Golden. It allows a short warmup before heading up Lookout Mountain. Once you’ve topped out there, head on over to I-70 and Exit 254. You can optionally avoid the worst of the traffic by sneaking up through the Nature Center and there’s some good short steeps awaiting you along the Mt Vernon Rd, home to the eponymous Mt Vernon Country Club. You’ll see the tennis courts as you climb the first steep grade. At exit 254 join the cars on the interstate. If you’ve got mechanical troubles or just need a pick-me-up, drop into Foothills Ski & Bike or the Buffalo Moon Coffee Shop, both just up the hill from Exit 254 near the Chart House. There’s no real trick to riding along the interstate–you just need to pay attention. Stay to the right side of the shoulder and avoid as much debris as you can. There’s an intermediate exit in between 254 and 252 to Chief Hosa. Ignore it. Exit to the Evergreen Parkway and climb up through the traffic to an uncontrolled left turn (i.e. no traffic light) onto Kerr Gulch Rd. The stretch along the Parkway can be tight at times, but with some heads up peddling you should be fine. Kerr Gulch is the second left after the traffic light. Once you are on Kerr Gulch Rd, you’ll be in another world. The houses start out all high and mighty near the top and dissolve into a sort of decaying squalor as you approach Highway 74. The road mimics the surroundings and the last mile or so is rough and narrow. Turn right, uphill, to reach Kittridge, then left to ride gulch number two, Meyers, a short, steep pitch of just two miles. 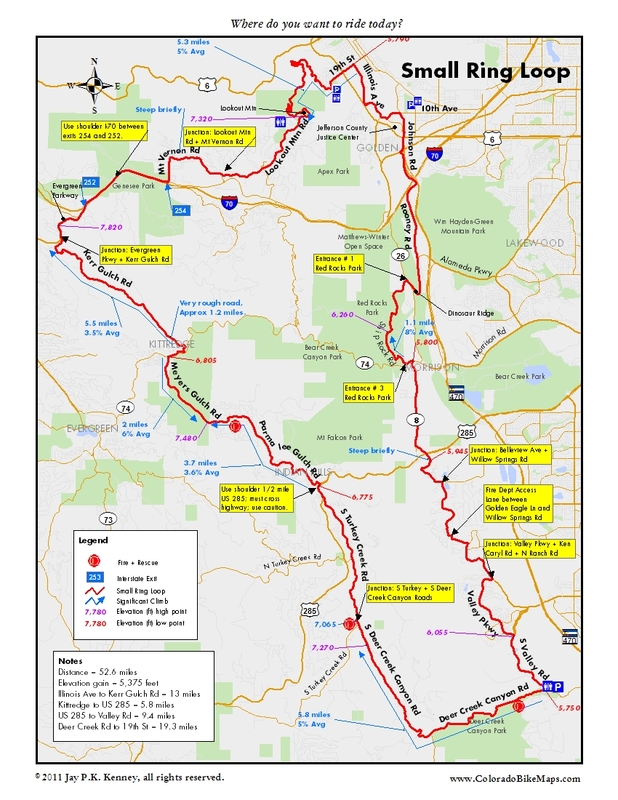 If you are totally whipped at this point in the ride, just point your bike downhill from Kittredge and ride Highway 74 east to Morrison, cuting off something like 25 miles of the ride. A gentle descent of four miles down Parmalee Gulch Rd brings you to US 285. Jump on 285 by going left initially. Follow the signs to Fairplay, not Denver. 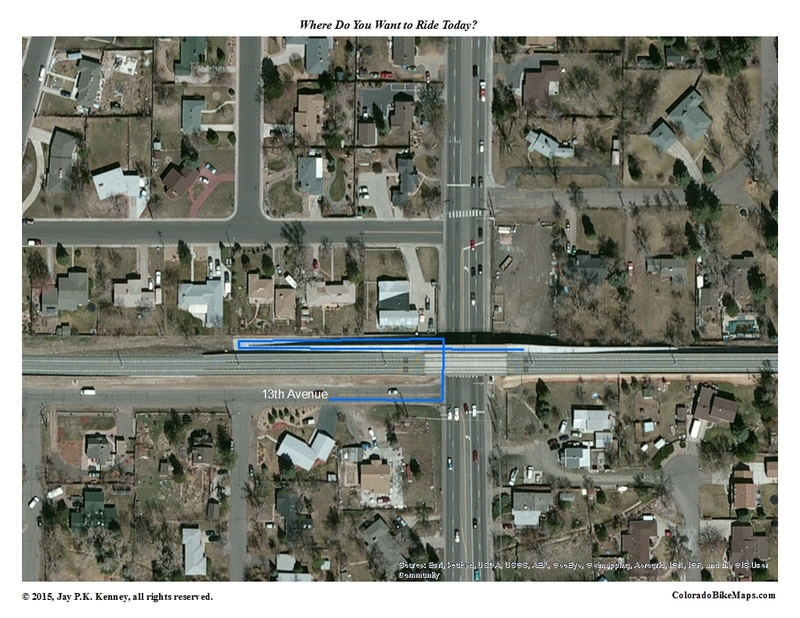 Here you have to make a decision: either ride 1/4 mile on US 285 and exit across 285 to S. Turkey Creek Rd (as you did on Evergreen Pkwy) or ride 2 miles on the shoulder to the N. Turkey Creek Rd Exit, which swings under 285 and thereby avoids having to cross the highway. Your choice: 1/2 mile and left or two miles and under. I much prefer the short jaunt, a quick scan backwards and the left hand turn. There’s a dedicated turn lane so it is easy to jump across, pause, get your bearings, and then make a bee-line to the other side. The Deer Creek Century understandably routes you along the shoulder but the traffic is rarely so heavy through here that you cannot safely cross. And if you are coming from the other direction, you don’t have a choice: get on 285 just past Tiny Town and exit at Parmalee Gulch by using the dedicated turn lane. will take you up, to, and through the Park and out the other side, to Entrance #1. Cross the road to Dinosaur Ridge. Go north along Rooney and Johnson Rds and you’re back where you started. The only tricky part along here is finding the bike by-pass between Colfax and 6ht Ave. From the traffic light at Rooney Rd and Colfax Ave, look northeast. You’ll see the trail just to the left and in the shadow of the C-470 overpass.